Sand and dust storms are growing in intensity and frequency in parts of Iran, forcing residents of the oil-rich southwestern Khuzestan province to move to cities with bearable weather conditions, according to an MP from the battered province. 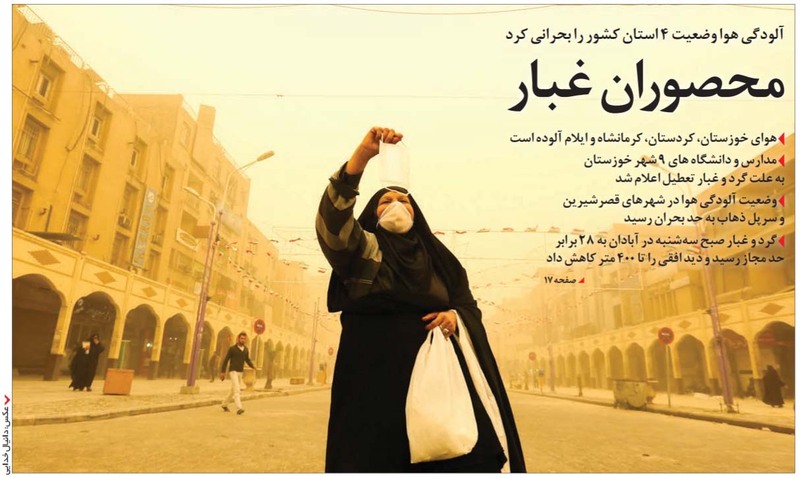 Speaking to state-run Iran Labor News Agency (ILNA), Javad Kazem Nasab Albaji, an MP from the Khuzestan capital, Ahvaz, singled out "dust particle centers" as the cause of outward migration from his province over the past 13 years. In recent years, sand and dust storms in parts of southwestern Iran have caused periodic closures of schools, government offices, and businesses, bringing life to a standstill for residents. Many also fear the impact on their health. Sand and dust storms have increasingly plagued countries across the Middle East. Though the exact cause of the increase in storms is not known, accelerated dam construction and diversion of water resources for agriculture throughout the region is thought to be the main culprit. The problem is exacerbated by mother nature as well. In January 2017, the Khuzestan provincial Department of Environment reported the concentration of fine dust in the Iranian cities of Ahvaz, Behbahan, and Masjed Soleyman stood at 627, 2,926 and 2,056 micrograms per cubic meter respectively, while the normal volume of fine particles concentration is 150 micrograms per cubic meter. Meanwhile, Khuzestan is also grappling with drought, water shortages, and soaring temperatures. Last February, the chief of Khuzestan's Department of Environment Ahmadreza Lahijanzadeh told local news agencies that drought spells and low precipitation in the area were making the storms more intense. The average precipitation in Khuzestan has decreased to two millimeters[per year? What year?] compared to 220 to 250 millimeters in years past, the Tehran Times quoted Lahijanzadeh as saying February 14. Mohammad Ali Tahmasbi, head of the National Project For Fighting Sand and Dust Storms, has said that average precipitation has dropped by sixty percent thisyear (March 2017-March 2018, according to the Persian calendar), compared to the previous year. Albaji says the sand storms are to blame for the exodus of elites from his province, and the subsequent economic downturn it is experiencing. The MP says the dust causes a slew of health problems, including pulmonary diseases and cancer. A report filed by local website "KhuzNews" supports Albaji's view. "Most of the people leaving Khuzestan are either elites affiliated with the sciences and universities or those rich enough to afford to leave," the head of the province's Management and Planning Department, Omid Hojjati, told the website. Within the last year, Khuzestan experienced 235 days of "unhealthy weather," Hojjati said, adding, "Bad weather conditions have decreased the province's population." Local senior officials insist Khuzestan is suffering from a brain drain and a lack of specialists despite being the country's fifth most populace province and the most important in terms of agriculture. "Within twenty years, all of Khuzestan's residents will have left," said Hedayatollah Khadami, another MP from the province. MP Abbas Papizadeh told state-run news website IRIB that some 22 Iranian provinces experience regular sand and dust storms, but the problem is not taken seriously by the government, as evidenced by the paltry budget allocated to tackle the worsening situation. "At this rate, nothing will improve for at least 10 years," he said. "While Khuzestan has been struggling with these dust storms for the past 16 years, the government only began addressing the problem within the last year. Even after a 2002 UN report warning about the grim future of the province, nobody took it seriously." Khuzestan is not the only region in Iran suffering from drought and lack of rain. Many Iranian villages, including in the North Khorasan and Isfahan provinces, have been left completely abandoned due to drought and poverty. The mass exodus of villagers to urban centers has in turn swelled the size of poverty-stricken city slums mushrooming around cities across the country. Most senior officials in Iran, including President Hassan Rouhani, blame Turkey and Iraq for the recent storms, pointing to what they say is unchecked construction and water diversion. Baghdad and Ankara deny responsibility.